Brought home a 1941 Snipe a few weeks ago. #4328 We removed the rotting plywood deck and found 3 spongy deck beams, everything else appears solid. From the pic of the boat without decking, it looks like portions of the stem need to be replaced with new wood/epoxy after cleaning out the decayed wood and cutting s new section to fit into the existing stem. This boat was owner-built? (no information) in 1941 and the original owner was in Port Washington NY on Long Island. It is a measured, class-legal Snipe and probably raced at Manhasset Bay on Long Island where there was a long-standing fleet after WW II. I have some historical info on this boat. You can contact me for further info and suggestions on restoration. The stem does need work also. But it appears to be solid and stable. We ordered a set of 1931 plans. It calls for the deck to be made of 1/2 inch pine covered in canvas. What are your thoughts on that? The original decks of that era were 1/2" thick cedar boards, typically canvas covered but sometimes varnished. Plywood decks (1/4" thick, now typically imported 6mm marine grade plywood) were approved after WW II. It is easier to do plywood now, but I would suggest sheathing over with 4 oz fiberglass cloth and epoxy resin. It can be painted or varnished if a clear epoxy resin has been used. I suspect the original cockpit shape was oval (radiused front end to match radiused aft end). Did you get any documentation of past history (builder, owner) with the boat from prior owner? Examine the centerboard (or daggerboard?) trunk construction, the seams at the inner keel/bedlog and end joint seams are typical spots for leaks. The bedlogs were typically bolted through from the inner keel, so to access the bolts a portion of the outer keel in the centerboard trunk slot area would need to be removed carefully (and replaced later if in good condition) using 3M 4200 sealant and screws). Hull seams should be routed 3/4" wide x 3/8" deep for gluing new cedar wood battens to replace caulked seams, use epoxy glue for gluing the battens. 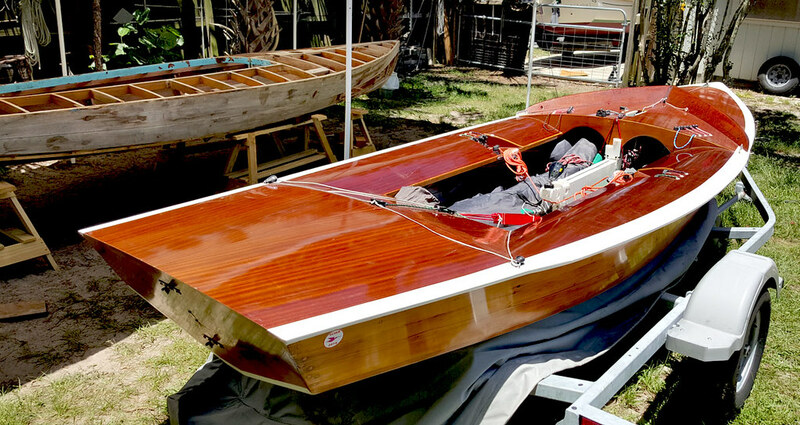 A more satisfactory bottom planking installation will result, but the boat should be "dry sailed" (hauled out of water after use) instead of leaving it in the water. I also had the bottom and sides sheathed with 4 oz fiberglass cloth and epoxy resin for better maintenance and less future repair. Looks like you have your work cut out for you. It is worth it. My first real sailboat was a very old Snipe. They are a very good boat, and even my old one would plane in the right conditions. I did get some info from the previous owner. He didn't know if it was owner built or not but the construction looks very good to me. The plans I have are from 1931 and the boat is a bit different. The deck appears more rounded on mine than the plans indicate and the mast is deck stepped on mine and keel stepped on the plans. Previous owner thought the plywood deck was a later addition ( early 60s he thought) and the centerboard trunk is plywood and also appears to be in excellent condition. When I get a chance I'll go through the info I got with the boat and post anything of interest. Finally got a chance to work on the Snipe. Centerboard weighs a ton! I love to see old boats come back to life. Will it be sailed off the trailer or docked/moored? I was wondering because of the caulked planks for the bottom with their necessity of swelling up to be watertight. In the first picture, I see what appears to be an aluminum mast. Is that class-legal or will you be making a wooden mast? We planned on sailing off the trailer. Its at a lake house but the lake is too small for the boat. the mast is wood just painted white. Good luck! I'm in the middle of a new snipe build. I also ordered the plans and have done a ton of research on line. Enjoyed the pics. The class now allows aluminum boards. When I restored a 1954 Snipe, I got rid of that 80 lb. steel board as quick as I could. Spirit, Are you building from those original 1931 plans or do you have an updated version? I have the version updated in 1961 I believe. Gives you the ISO for the rolled down sides. All of the details still show 3/4 planking sim to original design. So I have used those and for the lines I use the dimensions provided by SCIRA which are metric and have to be converted. The keel offsets are different on the SCIRA measurement sheet from what the plans show. I default to the measurements in all cases. Where can I order those updated (to 1961 lol) plans? Build (Rebuild ) day #2. Removing the keel and 75 years of assorted rivets, screws, nuts and bolts brass, copper, galvanized, rusted etc. Centerboard trunk removed. Sides of trunk are plywood but bedlogs appear to be mahogony and trunk is in great shape. Now the search begins for a 16' x 4 1/2" x 3/4" piece of white oak. Brings back old memories. Bought two Snipes from a girls camp in 1959. They were old and tired. Made my trailer into a double decker so I could bring both home at once. Put the best one on first, built aflame around it and put the second one on. Stopped for gas on the way home and the owner of the station was all excited about the boats and bought the one on top for more than I paid for both. Gave him one set of sails with the boat and off I went with a free Snipe and cash to boot. Lots of fun with that boat until it got wrecked in a storm. Wish I could make deals like that every day. I remember the cockpit as rectangular. Original plans from 1931 show rectangular cockpit and flat deck. This one was built in 1941. Guess the ones you bought in 1959 were built from original plans? A pair of 1951 Snipes #8653 has been rebuilt to current class racing standards with air tanks fore and aft. #8570 will be restored to the 1951 style rig with the original wood mast. Both boats are Juniper planked and built by Clark Mills. My father had a Snipe that was, probably, built close to the time yours was. It had a rectangular cockpit. Beautiful Boats Mr Jones. Forgive my ignorance, are the seams on the finished boat caulked? Is it sealed with epoxy? I have a place south of you in Fla. I'm towing this Designers Choice down soon to sail on Charlotte Harbor/ Myakka river. Similar in size and sail area to the Snipe. "#8653 has been rebuilt to current class racing standards with air tanks fore and aft." 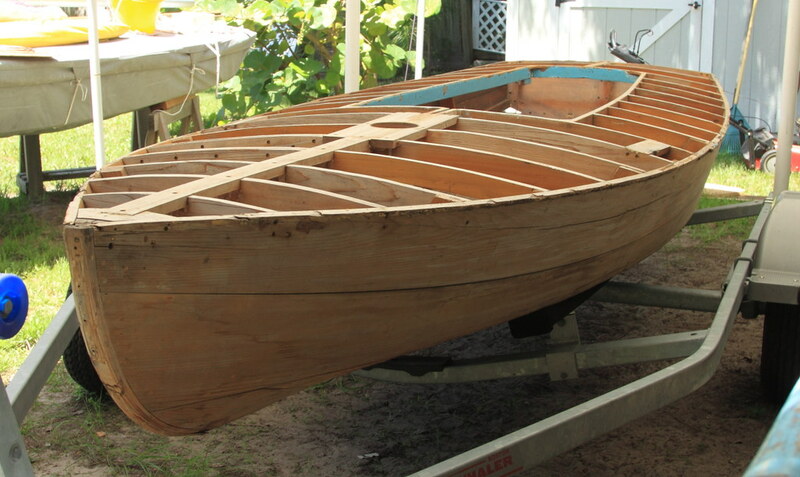 This Snipe was rebuilt by Norton Boat Works in Green Lake WI. High Quality Work. We have managed to secure a beautiful piece of White Oak 16'x 4 1/2"x 3/4" to replace our Keel. 1)Will we be able to attach this without steaming the Oak? 2) I believe the Keel will sit a little proud once attached. Is it ok to screw it on, countersinking screws and then hand planing or power planing the keel to a smoother profile? Pack it in damp sawdust for as long as practical to impart a bit of maximum flexibility. Be sure to read the annular rings so as to have the stock take a high center bow across the beam with the outer edges low and the inner portion convex as it takes on water and warps a bit when launched. This means that the outside of the tree is facing the inside of the hull! This will insure longevity and a tight set of caulk seams. Counterbore the fastenings to sink them below the intended fairing and then plug them with with oak made from the same stock. We ripped our piece of oak to 4 1/4 inches and then test fit and planed the edges for about one hour until it fit perfectly. we temporarily screwed it to the keel batten so we could feel like we're making some progress. Next step is to fill 50+ old screw holes in the keel batten with some doweling and wood glue. After that permanently attach the keel. Here's the question.Read on here many times that epoxy doesn't work well with White Oak what should we use? While I've never used it we do have some 3m 5200 on hand. Use the same paint you use on the resto of the bottom. One trick to make it stick is to avoid the use of primers or sealers and apply a thin coat of the finsh material. keep reducing thinner with each successive coat till you get complete grain saturation and a smooth finish. This will insure permanent bonding of the paint. Finally another work day on the snipe. Spent 4 hours sanding and found most of the planking to be in very good shape. Our thought now that the bottom paint is removed and all the screw heads are exposed is to take damaged or loose frames off one at a time and repair or replace. I also bought a bag of sails at an auction and found this witch head sail in it. Is anyone familiar with it? Luff is about 13' Foot about 9' Leach 16' or 17' Has a sleeve for the mast.